The latest volume of Studio Visit Magazine has arrived! I just got my copy the other day. It’s Volume 5, the Spring 2009 edition. My work was selected (again…yea!) for inclusion. 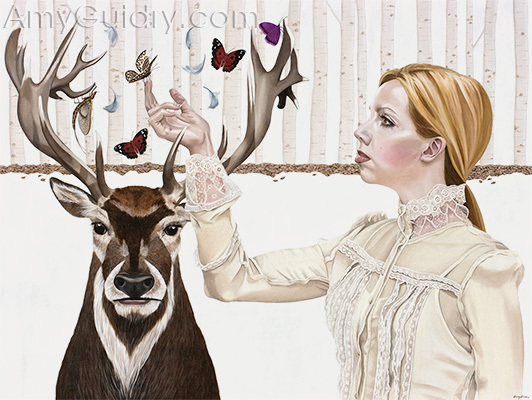 My painting, “Adaptation,” from my “New Realm” series is featured. The juror for the Spring 2009 issue was Michael Klein, an independent curator and private art dealer. He was the former Director of the International Sculpture Center and former Curator of the Microsoft Art Collection. Studio Visit is published by the Open Studios Press. Studio Visit is the new sister publication to New American Paintings. 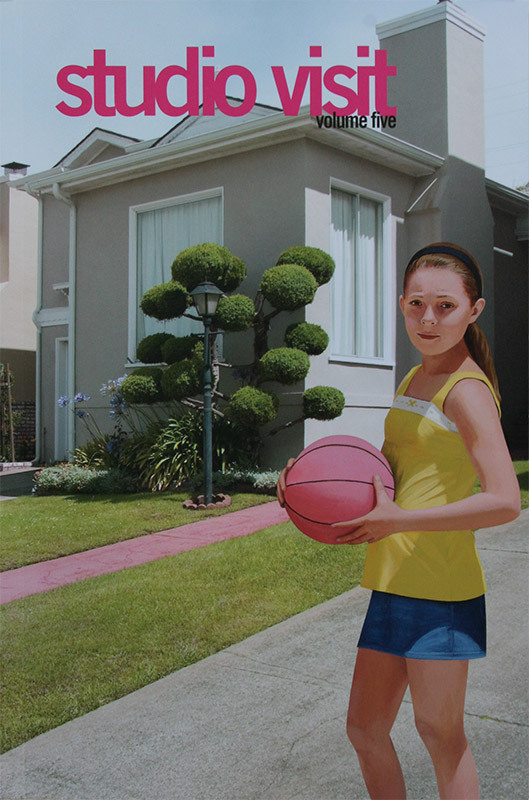 In contrast to New American Paintings, Studio Visit Magazine is an internationally juried publication featuring 2-D and 3-D artwork. 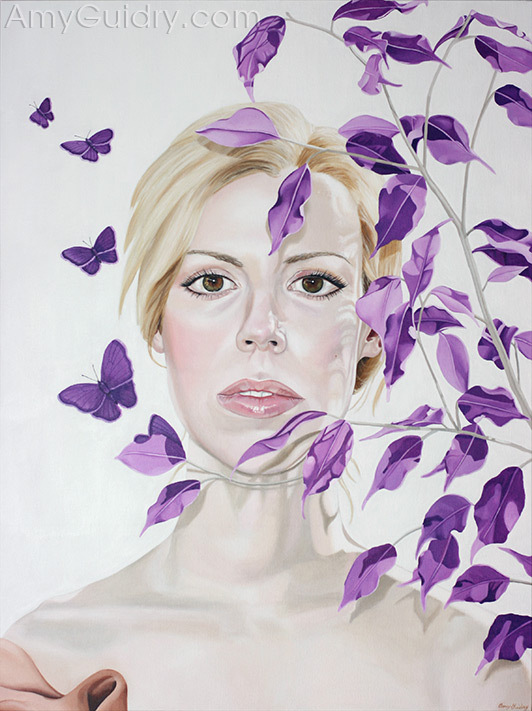 Featured jurors are internationally recognized professionals in the art industry. My painting “Adaptation” was accepted for inclusion. (See photo on the top right.) It is from my “New Realm” series and is currently at Wally Workman Gallery in Austin, TX, which is one of my representing galleries. To view more of my work, or a larger image of “Adaptation” visit my website at www.AmyGuidry.com. As far as reasons behind the rejection go, one of the more common reasons that Mr. White does not mention is that gallery’s have, in general, 12 exhibits a year. So that usually boils down to only 12 of their artists being shown in one year (except in a group show, of course). So it is not surprising that galleries, museums, and art centers usually have a full calendar for two years in advance. Sometimes 3 years. Just because a gallery isn’t interested at the time, doesn’t mean they won’t in the future. Perhaps they will keep your information on file. Perhaps they would like to stay in touch with you. It would be wise to maintain some type of relationship with these people. If you truly love the space, then it’s worth the time and effort. Not that you should do this anyway, but if you are randomly sending your work to any and every gallery, then it’s impossible to maintain relationships with all of these people. But if there are a few spaces you would give your left arm to be in, it would be in your best interest to stay in touch. And I don’t mean in a looking-to-get-a-restraining-order sort of way, either. Just get to know everyone on a personal basis. Learn their names. Go to their exhibits. Show a true interest in their artists’ work. THEN you can fill them in on what you’ve been doing. I liked that Mr. White ended with saying to use rejection as a motivation to move forward. Aside from moving on, though, look for ways to turn rejection around into something positive. There may be another opportunity there, you just have to dig a little. "Journey" by Amy Guidry; SOLD; From the New Realm series. Copyright Amy Guidry 2009. Here is the latest painting from my “New Realm” series. The title is “Journey” and is part of the “New Realm 5 x 5’s.” This has been a popular size for me as it is relatively easy to find a space for a small painting, plus they are budget-friendly for just about anybody looking to add to or start an art collection. “Journey” features one of the symbolic red and black butterflies as seen throughout “New Realm” as well as the heroine of the series. If you are in the southwestern Louisiana area, you can pick up a copy of the May 1st edition of “Lagniappe.” My painting will be featured in the Up Front column as well as an article about my upcoming shows. Just look for the article titled, “Fish, Feathers, and Royalty” by Brad Goins. And if you’d like to see more of my work, go to www.AmyGuidry.com. 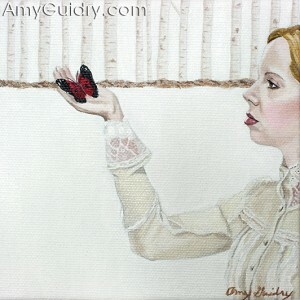 "Metamorphosis" by Amy Guidry; Copyright Amy Guidry 2009. 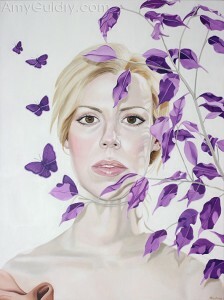 My work is currently showing in the “Hope” exhibit at R. Coury Fine Art Gallery in Savage, MD as part of Pinkapalooza. This event benefits the Blossoms of Hope Foundation which helps families coping with cancer. Half of the proceeds are donated to the Blossoms of Hope Foundation. My “New Realm” series will be featured at the Schepis Museum in Columbia, LA in the Spring of 2009. The solo exhibition will open after museum renovations are complete. Details to follow soon. The Oak Street Gallery in Hammond, LA will feature my work in a solo exhibition this August. I will be showing the “New Realm” series, featuring many pieces that are new to the exhibition. I will also serve as a representing artist for the Oak Street Gallery in the Louisiana Public Broadcasting Art & Travel Exhibit. The exhibit will take place at the Louisiana State Museum in Baton Rouge, LA from April 25th to May 18th, with an opening reception May on 2nd. The auction will air June 7th on LPB. Also showing later this month is the GreenScape exhibit at the Cotton Shed Gallery in Savage, MD. I will be a featured artist as part of the R. Coury Fine Art Gallery. The exhibit will open April 15th and close with a reception on May 3rd. I will be showing at Galerie Lafayette in Lafayette, LA for a second solo exhibit. I will show the “New Realm” series for the first time in this venue. The show is scheduled for the month of October in 2009. The Alexandria Museum of Art in Alexandria, LA has recently invited me to have a solo exhibition. I will exhibit my “New Realm” series at the museum in 2010. Also scheduled for 2010, I will also be showing in downtown Lafayette, LA at Gallery 549. The exhibit will feature six local women artists. More details to follow soon. I am now represented by the Oak Street Gallery in Hammond, LA. I have also recently attained representation at the R. Coury Fine Art Gallery in Savage, MD. I will be teaching my course, Art Marketing and Self-Promotion, at Frederick l’Ecole des Arts in Arnaudville, LA again this May. The class will be May 2nd (a Saturday) from 10AM-12Noon. Go to http://frederickarts.homestead.com/Registrationforms/GuidryAmyartmarketingregistrationform.html to register for Art Marketing and Self-Promotion. Sign up early to ensure your spot in the class. Registration is $30. The only supplies needed are a legal pad or notebook and pen for note-taking. The first video of my work is now online. This preview video features my “New Realm” series and spotlights some of the paintings, providing commentary about each piece. You can view the video on YouTube at http://www.youtube.com/watch?v=7uL3H_rKW1k or at www.AmyGuidry.com. The video can also be found at Daily Motion, Veoh, and BlipTv. The next edition of Studio Visit Magazine will feature my work in early 2009. My paintings were selected by Michael Klein, curator and private art dealer. He is also the former Director of the International Sculpture Center and former Curator of the Microsoft Collection. The magazine is scheduled for shipment April 15th, and should be in stores by April 30th. 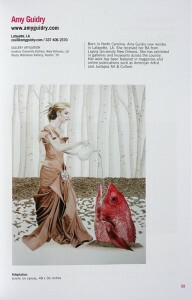 I have been recently selected for the 2010 publication in Marquis Who’s Who in America. The next edition will be published in October of 2009. I recently received a letter from the Marquis Who’s Who committee inviting me to be in the next edition of Who’s Who in America. Actually, they just needed me to update my biographical information since they already have that in their database, but I was honored, nonetheless. I’m currently published in the Marquis Who’s Who of American Women and Who’s Who in the World. So now I get to be in the 2010 edition of Who’s Who in America. It will be published in October of this year. And in case you can’t make it to the library and look up this publication, you can always check out my biography (and my artwork!) at www.AmyGuidry.com.